How old when went your first went into bonded labor? I was in the 9th standard. My grandfather and father were all in bonded labor as well. How many years did you work there? I worked there for 2 years to pay for Rs. 800 that my father had borrowed. How did they get out of this labor? Why did you have to start working to pay off your father's loan so young? from the land owner. He could not pay it back, so he left his wife and he ran away. I was studying in a hostel in the 9th standard and went home for the holiday. The land owner came to our house at 5am when I was sleeping and they harassed me. They brought many other people with them (the main people of the village) and they collectively told me that I had to pay off the Rs.800 debt. I was just a student and did not have money to give the landowner, so I went to work for another landowner and went to his place to work. I borrowed the Rs.800 from this other landowner and settled the debt with the original landlord as I did not want to be under him. Then I worked for 2 years and worked to pay off this Rs.800. I started work at 4am with the cows and buffallo and then I went to the agriculture land and brought the grass to the cows. Then he harvested the water for the agriculture land (manual irrigation) till all night. When and where did you sleep? When I took the cows out, there I would slept out with the cows. How did he get out of this? 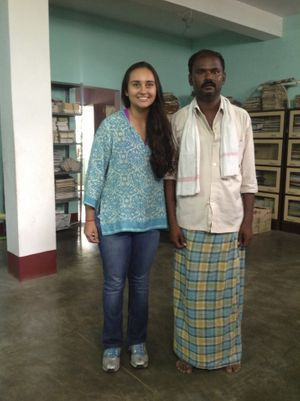 I found out about the bonded labor situation through Jeevika. I now work with Jeevika from in 1993 till now. As I paid the bonded debt and because the land owner was treating me well, I was able to work with the land owner on a more formal basis and started to create a plan for my family. My grandfather had 2 acres of land. When he was working for the land owner, he borrowed the money, and they took this land as collateral. But, due to the awareness from Jeekika, this time I took money from the landowner in writing. I worked for the land owner for an additional 2 years and repaid Rs. 2,000 and I took back this land. In the newspaper, I saw a bore well that the government was giving for free for the Dalits. So I got water also in this well. Then I extended another 2 years, so that I could build a hut/home for my family on the grandfather's land. I had 3 sisters from my father's second wife. When they were going to get married, again I took money (Rs 10k) from the landowner and paid that off. Did you father ever come back? he was during that time. He must have been close as he knew to come back after all the debt was cleared. How did you forgive your father? There is no other way as he is my father. If I tell him something about why he left and what I had to do, then he threatens suicide. He never explained where he went...just that he was outside the home. When you were in the bonded labor, how were you treated? What were the conditions? I was generally treated well, which is why I kept renewing the agreement. I now am working with Jeevika and joined Kirin in 1994. I am dedicated to giving awareness to the bonded labor situtation. What are 1723 bonded laborers have been free and the government has been giving different plans to buy things for these people to begin a living. IRDP scheme...for getting cows for milk, or some get money for a business. Also the self help groups are also very helpful for the women. courage to stand against it, and the opportunity to improve my life. Now I also have taken a gas agency (distribution of gas containers). My plans are to continue doing work to help others and raise awareness. We are wanting to help raise awareness as well. Can you share with us any stories that you think will be important for others to know about from your work with Jeevika over the past 29 years? 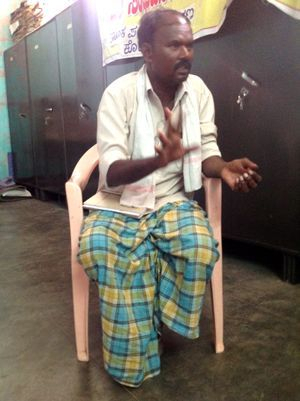 In the village of Shivvapura, there was a landlord named Nagaraju and he has 50 acres of land and 25 people were working as bonded laborers. One time these folks were not coming in to work. The landowner got mad so he took a JCB (digging machine) and he went to the people's homes and smashed all the homes of the 25 people. These homes were on his property. After this incident, I went with 5 other people from Jeevika and tried to file a complaint against the landlord, but the police did not take the complaint as they were favoring the land owner. So I started a sit-in/protest/strike with 100 people. I also went to the Taluk office and filed a complaint there. All night we stayed there and did not eat or drink and just stayed in front of the office. But instead of hearing our complaint, the Taluk officers raised a case against Jeevika that we were preventing public works. After this incident, Nagaraj came to my house to give me Rs.20k in order to try and bribe me not to continue this work against him. If I would not take it they he would even pay me much more...Rs.50k. But I did not take it. So instead, Nagaraj sent the "rowdys" and tried to beat me up, but I was able to escape. I was going away by motor bike, and some people came to get me and they threw sticks at me. In the forest area, they stopped their car and they stood there to hit me with sticks. But one stick hit another bike instead and that person fell down. So the rowdys got scared that there was a witness and left. Then I raised this case that they tried to kill me with the police department but again the police did not take the case. After all this I met with Kirin to ask for advice and help. Kirin met with higher officers and brought all 25 people to Bangalore and arranged a press meeting with the Bangalore Press. After this we gave a complaint to the Deputy Commissioner (DC). The DC did the right thing. They gave new homes to all these people and they are now all working in other real labor jobs. The case against Nagaraj is in the court right now, but I am not following what is happening with it. There were nearly 4,000 children ages 6-14 years old who were not going to school back in 2001-2002. They were very poor people, so they could not afford to go to school and the parents did not have the understanding of how important education was for their children to prevent them from also falling to bonded labor. Jeevika helped to find these children and had them start going to government schools. Three years ago I found 3 children who were working in bonded labor as cow shepards. We were able to get them released.